This Scientific American edition covers the 1900 Paris Exposition. 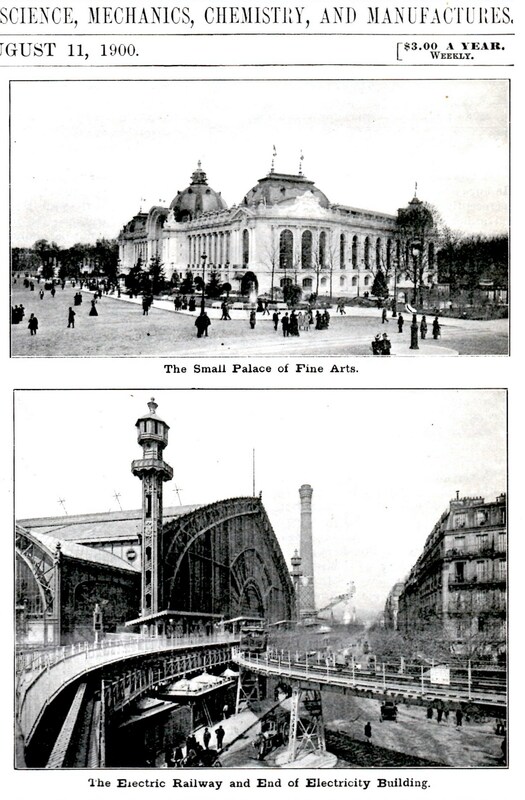 On the front, there are photos of “The Large Palace of Fine Arts,” the “Small Palace of Fine Arts,” the “Moving Platform,” the “Electric Railway and End of Electricity Building,” and the “Street of Nations” on the Bank of the Seine. The electric railway is intended to enable visitors to move in an opposite direction to the sliding platform, three cars capable of conveying about two hundred persons forming the train, and electricity is delivered to the motors by means of a third-rail. The trains follow each other at intervals of two minutes. The circuit is completed in about twelve minutes, including stoppages. The second day of July will long be remembered by aeronauts, for on that day occurred the first ascension of the great airship just completed by Count Zeppelin, the cavalry officer of Wurtemberg, who has so long been superintending the construction of his balloon in a huge floating house on Lake Constance, a site admirably adapted for work of this kind, as it offers ample space and in case of accident the results are likely to be much less disastrous than on land. … The Zeppelin airship belongs to the class of so-called aerostatic balloons or dirigible airships which hold a middle ground between the purely dynamic flying machines and the manually-operated devices, resembling in this respect what are known as “balloon flying machines;” that is, those airships in which hydrogen is used only for keeping the apparatus suspended, which the mechanical power is employed for driving and steering it. There are some wonderful engravings which accompany this article. 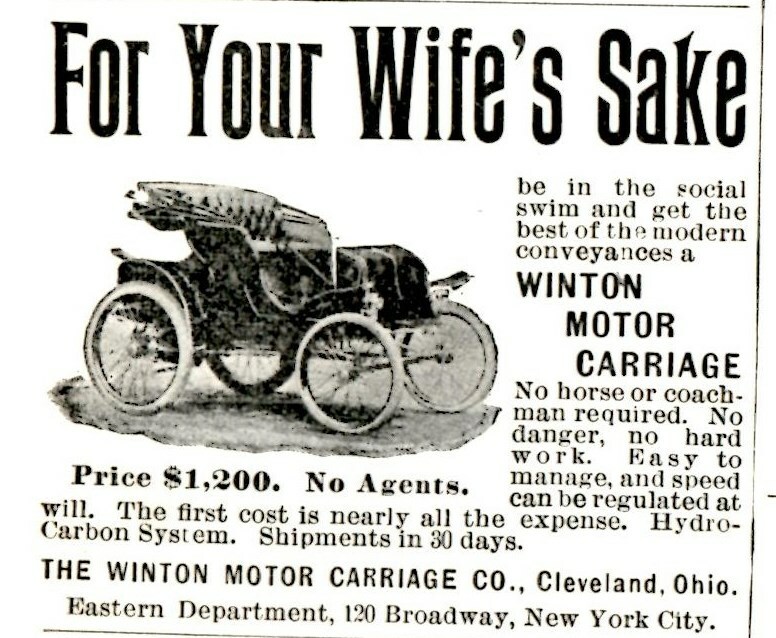 In addition, the ads on the back page are noteworthy and interesting. 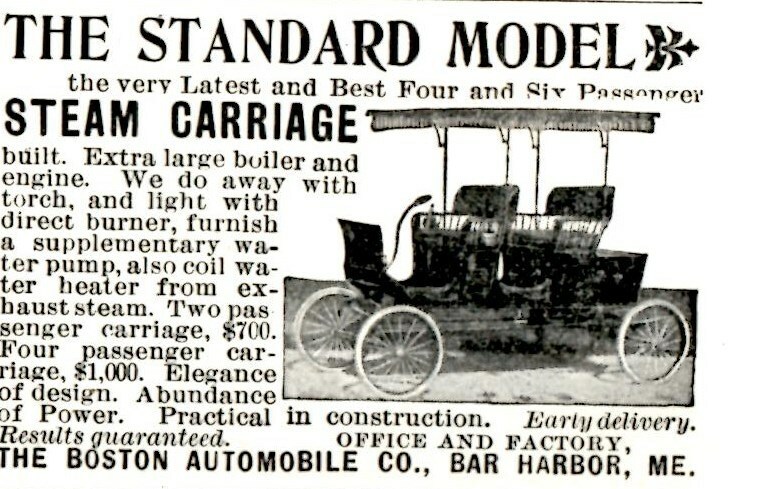 Here are some examples of competition in the early automobile industry – hydrocarbon system for the Winton Motor Carriage and steam for the Standard Model Steam Carriage. This and other original Victorian Era newspapers are available for purchase at Steam at Harper’s Ferry. Contact us for purchase price and delivery options.